The streaming music scene seems like it’s ruled by a few heavyweights, with Pandora, Spotify, and Rdio slugging it out for your hearts, minds, and eardrums. But that’s only part of the picture. Just as several lower-profile video streaming services vie with the likes of Netflix and Hulu, music streaming services you’ve probably never heard of are looking for ways to make their mark with features the established players don’t offer. Which subscription music service will emerge as the next Spotify or Pandora? We’ve spotted five interesting alternatives that bring their own unique twist to music stream. 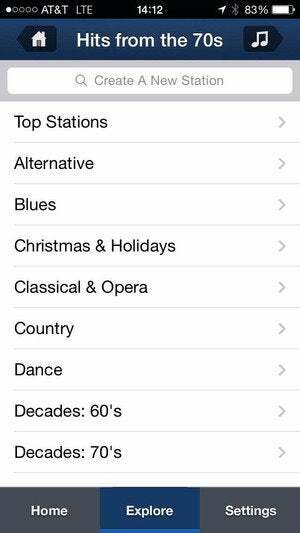 Like other streaming services, Jango lets you build personalized radio stations based on particular music genres. 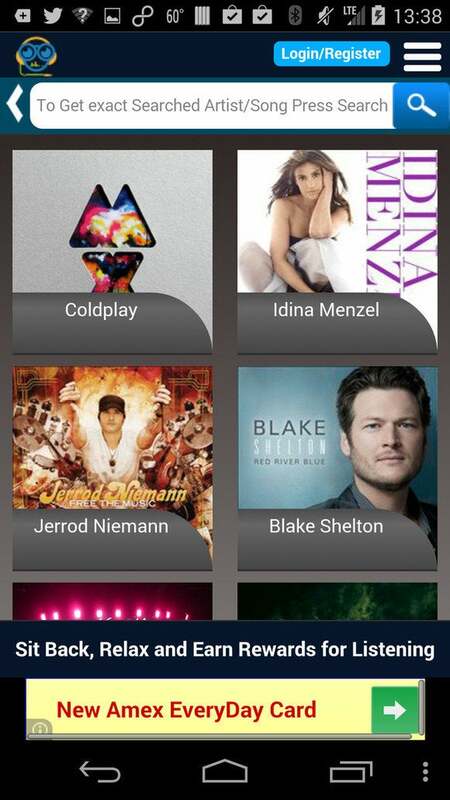 Like Pandora, Jango lets you create personalized radio stations based on an artist or song you want to hear. Simply type an artist or song into the search box, and Jango starts playing music that fits the bill. The service offers apps for Android and iOS as well as a decent Web interface providing lyrics, information about the artist, and even the ability to watch the music video when available. Jango’s a free service, which means ads. And unlike some of it’s rivals, there’s no way to buy your way out of them. That said, Jango takes a slightly different approach than Pandora or Slacker Radio do with ads: Instead of serving them up after a certain number of songs, Jango offers one video and/or audio ad per day. (Artist promotions are strewn throughout Jango, though.) The ads aren’t particularly off-putting, though I wish there was an option to get rid of them by buying a premium subscription. What’s good about Jango: Sound quality can be a subjective thing, but I appreciated what I heard on Jango. Music streams fast, and Jango offers unlimited skips, something that frequent streaming listeners often cite as one of the most annoying parts of streaming radio. What could be better: Jango’s music catalog is fairly robust, but it’s a bit smaller than what you’ll get from more widely known services. StationDigital offers a library of more than 20 million songs and a unique reward system that gives you a virtual currency to redeem for more music. Boasting a library of more than 20 million songs, StationDigital offers curated stations; users can also create a station of their own based on a particular song or artist. The service offers apps for Android and iOS; it says Windows Phone and BlackBerry apps are coming soon. Listening via a browser treats you to karaoke-style lyrics that follow along with the currently playing song. You’ll experience ads if you listen for free, but StationDigital also lets you pay up for a premium subscription—$4 per month, or $36 for the year—that removes ads while offering higher-quality audio and fewer listening interruptions during the day. Premium subscribers also get access to a desktop application for listening to StationDigital without a web browser. Both the cost of the subscription and what it gets you are comparable to what’s available from out subscription services. What’s good about StationDigital: A unique reward services awards stars—virtual currency that you can redeem for songs, albums, and all kinds of other items on the StationDigital store. You earn stars for signing up, sharing, and voting on music, or just listening to your favorite stations. What could be better: While the service itself is rock solid, the same can’t be said of StationDigital’s mobile apps, which are in due of a major interface overhaul. In addition to creating customized stations, you can also listen to live radio from across the U.S. with iHeartRadio. Most streaming services let you create customized radio stations or preset genre stations; iHeartRadio takes it a step further. You can create custom stations by artist or song, or you can listen to live radio stations from all across the U.S. iHeartRadio also lets you set your mood or an activity, and will play songs that fit the situation. iHeartRadio features apps for Android, iOS (with separate iPhone and iPad offerings), Kindle Fire, assorted flavors of Windows (Windows Phone 8, Windows Phone 7, and Windows 8), and BlackBerry. You’ll also be able to get iHeartRadio on connected devices including Amazon’s Fire TV, Xbox, Roku, Logitech Smart Radio, Sonos, and Yahoo TV. iHeartRadio has partnerships with several car companies, so it’s included as an app on many vehicle entertainment centers. What’s good about iHeartRadio: iHeartRadio’s presence reaches far and wide. It’s perfect for folks who either travel often or have moved to a new spot and just want to listen to the familiar radio stations from their hometown. What could be better: The major limitation of radio stations—and iHeartRadio, by extension—is that they play what they want, not necessarily what you want. Other services offer content better tailored to you. 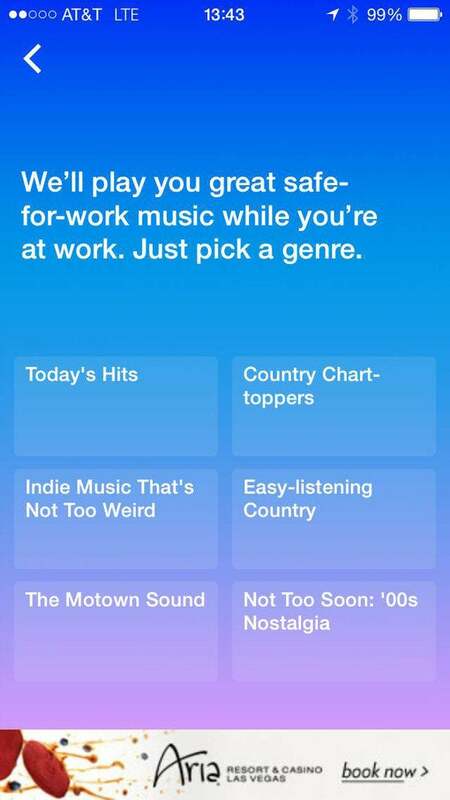 Launch Songza, and the service asks you time-appropriate questions to determine what kind of music fits your mood. While there’s a lot to be said about music services that let you play whatever you want, whenever you want it, sometimes you just want to hit a button and have the perfect music start playing. When you first launch Songza, the service displays the time of day and several time-appropriate activities to select from. On a Monday night, for example, you can ask Songza to play music for studying. 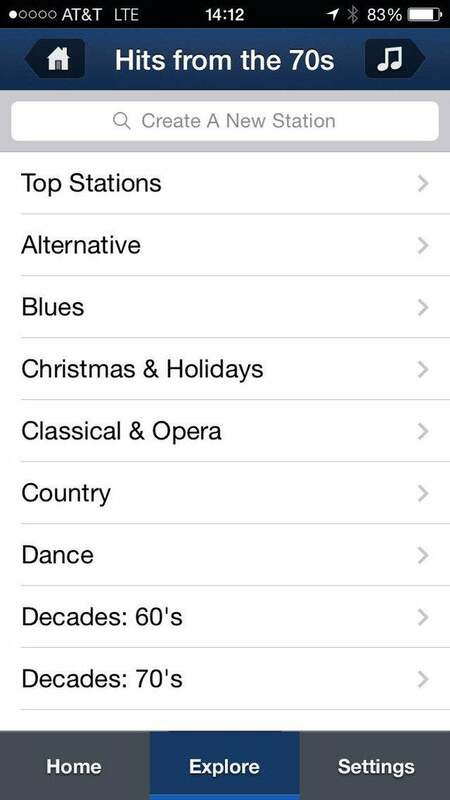 Select a subgenre that fits your music preferences, and Songza will play music that matches that activity. Songza also offers genre stations, if that’s what you prefer. You can listen via apps for Android, iOS, or Windows Phone or through a simple, intuitive interface for web that makes it easy to use and find the music you want. What’s good about Songza: Songza probably has the most creative music selection tool this side of Beats Music, and it gave me the best overall experience of the music streaming services I sampled. What could be better: Songza’s creative music selection is solid, but its apps are known for straining your device’s battery. 8tracks focuses on mixes—either mixes that you create or user-created ones spanning multiple genres. Most of today’s streaming services aim to provide expert or algorithm-developed playlists. 8tracks is different. Users either create a mix of at least eight songs or listen to mixes created by other users. Tons of user-created mixes span multiple genres, so it’s easy to find hours and hours of music to keep the party going. A free service, 8tracks has apps for Android, iOS, Windows Phone, and BlackBerry, as well as a smattering of third-party apps for other platforms. The premium 8tracks plus offering removes ads for $50 per year. What’s good about 8tracks: The ability to enjoy user-created mixes gives 8tracks a unique social component: You can follow users who make mixes you enjoy. What could be better: Each of 8tracks apps are well designed, but I found it difficult to find content among the sea of playlists out there. Better search tools would greatly improve the experience.